Nasako Besingi (l), the director of the local NGO Struggle to Economize the Future, has been arrested an intimidated by police because of his protests against a controversial palm oil planation development in Cameroon’s Korup National Park. Courtesy: Frank Bieleu/Oakland Institute. YAOUNDE, Dec 20 2012 (IPS) - Protests against a controversial palm oil plantation in the Korup National Park, Africa’s oldest and richest rainforest in terms of floral and faunal diversity, in Mundemba, southwest Cameroon will continue despite the arrests and intimidation of local environmental campaigners. The New York-based agricultural company, Herakles Farms, has been accused of grabbing a piece of this central African nation’s national forest as it goes ahead with a 73,000-hectare palm oil plantation despite a lack of government authorisation – there are claims that the 99-year lease agreement with the government is illegal – and two court injunctions, and in the face of significant community opposition. The contested land is a “biodiversity hotspot”, a critical area that connects five protected areas in the park, and the project will disrupt the protection and growth of important wildlife, the German Agency for International Cooperation (GIZ) said in an environmental and social impact assessment in August. About 46 percent of Cameroon’s 20 million people live in rural areas, but according to a USAID country profile on property rights here “only approximately three percent of rural land is registered, mostly in the names of owners of large commercial farms.” The country is ranked 131st of 169 countries on the 2010 United Nations Human Development Index, partially due to persistent poverty. Besingi said that he and his colleagues have endured police suppression, arrests and intimidation. His latest arrest was on Nov. 14, when the country’s national military police stormed his office. “We were told we were required for questioning at the police post, and were detained for a day without charge. But it was only following international and local pressure that we were released (on bail) under the condition that we must appear before the authorities whenever we are (asked),” he said. Besingi explained that the palm oil plantation project was going ahead despite the lack of a formal government agreement, because Sustainable Oils Cameroon (SGSOC), a subsidiary of Herakles Farms, had the support of those in power. “SGSOC enjoys support from some elites, the chief of Fabe village (which is on the project site) and some government representatives, including the police. They have been bought over with money and material things. These groups of people, including the government, are misleading the people,” he said. Q: What is your interest in this campaign against SGSOC/Herakles Farms? A: We cannot just sit and allow a few individuals to ruin the lives of thousands. So we have to make our voices and those of the voiceless heard. Giving so much forestland to a company that has no real development plan for the people is injustice against a people who cannot have access to one-third of the forestland. Many locals feel there are already too many protected zones in the (forest). This massive plantation will further restrict their access to land. Q: Bruce Wrobel, CEO of Herakles Farms, said in September that the organisation was already employing more than 500 people, and has committed to hiring among the local villages. He said that once the plantation was fully operational, it would require approximately 8,000 employees. Is this not an opportunity for the people? A: There is little evidence that large-scale plantations will effectively bring economic development to this area. Past experiences in the country show such promises … to be false. Instead, large plantations have resulted in massive environmental degradation, the destruction of livelihoods, and the transformation of small-scale farmers and indigenous populations into low-paid plantation workers. The company claims that it will create 8,000 jobs. However, the plantation will economically displace approximately 25,000 people who depend on that land for small-scale food production, hunting, and non-timber forest products. Thus, the net impact on employment will actually be negative. Q: What is the problem with land management issues in Cameroon? A: There are two fundamental problems in my opinion. Firstly, communities do not have legally-recognised land rights that secure their access to the vital natural resources that they depend on; and secondly, Cameroon is still to develop a national land-use plan which would, in principal, evaluate the needs of local communities before granting foreign investors access to land. Q: What would you want SGSOC/Herakles Farms to do before operating? A: We demand that SGSOC respect Cameroonian law and the rights of communities. Unfortunately, SGSOC has repeatedly violated Cameroonian law. They have signed an illegal contract with the government, and have shown no respect to local communities who, on the majority, oppose the project. 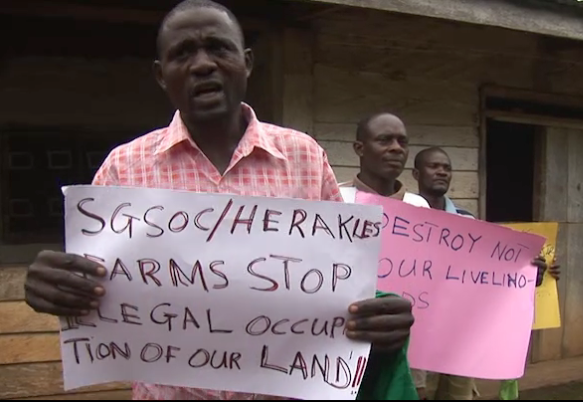 Following the 1976 law governing the allocation of concessions on state lands in Cameroon, subsequent to signing the lease agreement, SGSOC was supposed to be given a presidential approval to start cultivation activities. But this was not given, so the project has been in violation of the law since 2010. Moreover, prior to its operations, an environmental and social impact assessment was not conducted. Q: What is the opportunity cost for the SGSOC/Herakles project? A: The opportunity cost for this project is the loss of forest revenue through the payment of environmental services, ecotourism and REDD+ activities. All these activities can generate more revenue for the state than SGSOC can. For example, the Cameroonian Food Sovereignty Coalition estimates that if the government were to require bread makers to use 20 percent of locally-produced flour, 96,000 farming jobs would be created using just 15,000 hectares of land. This would generate 13 times more employment and significantly larger government revenue than the SGSOC project and would leave land for peasant agriculture, conservation, and the use of non-timber forest products. Q: What next with your campaign against SGSOC/Herakles farms? A: We won’t stop until environmental justice is done. We want a new agreement that takes into consideration the sustainable management of that forest and that gives the locals better access to land and alternative livelihoods. We are currently working with more than 20 community groups and international and local NGOs and using every possible channel, like IPS, to reach the international community. This project must be stopped. Its sheer madness to be creating a palm oil plantation right in the middle of national parks and protected forests. Research has shown time after time that by fragmenting wildlife habitats with industrial plantations we will send them into extinction and that area is home to 3 really special primates found nowhere else in Africa! How can it be illegal and police are backing them that’s what’s you think but it’s because the government told them to make it look that way .it’s really a shame they want to destroy everything before they die ,from economy through resources and environment .